Amidst all the frenetic disarray of budget day, I had an interesting and informative exchange on CBC’s Power & Politics with John Manley, former Liberal Finance and Industry Minister, and now chief lobbyist for Canada’s corporate elite (as President and Chief Executive of the Canadian Council of Chief Executives). Remember, Manley’s clientele are the recipients of by far the budget’s largest single piece of largesse.Â $6 billion per year worth of corporate tax cuts towers far above the many other little trinkets and baubles offered up by Finance Minister Flaherty.Â This year and next the Harper government will reduce the corporate tax rate by one-sixth (on top of previous substantial reductions).Â For Mr. Manley to then imply that the government could have gone a little faster in eliminating the deficit, struck me as a bit precious.Â So I suggested that if he wanted the deficit gone sooner, he could give back some of the $6 billion. Private business investment is essential to employment and prosperity, and you need to reward investors mightily if you want it. We will all share in the resulting benefits, because we are all part-owners of those businesses through the stock market. We need collectively to do much more serious and sustained work to destroy those two claims, in order to win the debate over corporate tax cuts and so many of the other planks of neoliberalism. Â I will attempt to do some of this in a forthcoming CCPA paper reviewing the history and determinants of business investment spending in Canada. Well, actually, no-one I know has proposed a tax on investment or enterprise or growth.Â (The old capital taxes, which are long gone, could to some extent have been considered a tax on investment – although they taxed all assets, not just real investment. )Â The CIT, in contrast, is a tax on profits.Â Profits and investment/enterprise/growth are not statistically correlated – at least not any more. 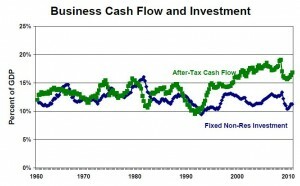 This figure shows after-tax cash flow (corporate profits less direct taxes, plus CCA) and business non-residential fixed investment, both normalized as a share of GDP.Â Businesses used to reinvest their cash flow in Canada (until about 1990 – shortly after we got into free trade).Â But they don’t anymore.Â The sharp rise in profitability and cash flow since 1990 (to historic levels as a share of GDP) has not been reflected in any sustained improvement in business investment.Â So claiming that taxing Canadian business profits profits is akin to taxing investment in Canada has no statistical credibility whatsoever. This is the old Laffer curve argument, that’s received a surprising amount of uncritical attention in recent debates in Canada.Â The idea is that corporate tax cuts are “free”, because they unleash such a wave of entrepreneurial energy that government CIT revenues don’t actually suffer.Â Of course, there are many factors that determine corporate profits.Â Things like rebound from a cyclical downturn.Â Things like global commodity prices (especially for Canadian resource companies).Â Things like the continuing structural rebalancing of Canadian society, making this an ever more business-friendly environment (like stagnant wages, declining unions, and weaker regulations).Â It is true that CIT revenues are not falling, despite the rate cut, because profits are growing strongly.Â But to claim that profits are growing strongly because of the rate cut stretches credulity entirely. At any rate, Manley’s claim about revenues is not really true.Â In the next two years, CIT revenues do grow faster than any other major revenue source (if you believe the Budget Plan, at any rate).Â That reflects the very strong cyclical rebound in profits happening right now, relative to the 2009-10 fiscal year (when CIT revenues bottomed out after the recession).Â However, in the long-term (looking beyond that cyclical rebound), CIT revenues actually grow more slowly than any other major source of federal revenue.Â This is shown in the preceding table, which reports the %age increase in revenues by source over 1-year, 2-year, and 6-year periods.Â If profits were growing because of unleashed entrepreneurial spirit and other Laffer-curve mechanisms, the effect should get stronger in the long-term, not weaker.Â Instead, the stability in CIT revenues post-2009 despite the rate cut merely reflects the cyclical rebound in profits.Â And it is worth noting that aggregate CIT revenues will remain far lower than they were in 2006 when the Harper government came to power. Erin Weir has repeatedly shown how misleading this argument is, since the entry of small, less developed, and low-tax jurisdictions into the OECD (powerhouses like Estonia and Slovenia) has pulled down the unweighted average which Mr. Manley invokes.Â The weighted average OECD CIT rate is 7 points higher than the unweighted average – and Canada’s existing rate is well below that weighted average.Â The claim that Canadian CIT rates are uncompetitive is preposterous.Â And the claim that cutting rates will boost our economy, as opposed to reinforcing a race-to-the-bottom in taxation that no-one can win (except the corporations), is dubious. This is trickle-down economics meets George W. Bush’s “shareholder society.”Â Since we all own shares, we’ll all benefit from making corporations rich.Â But hold on.Â We don’t all own shares.Â And some of us own a lot more than others.Â Canada’s 50-odd billionaires own twice as much financial wealth as the bottom 50% of the population (17 million people).Â We can’t let them get away with this argument.Â That will take ongoing documentation of the astounding maldistribution of financial wealth, and the failure of RRSPs and personal investing as social policy. Well, at least I’m consistent.Â I took my first undergrad economics course in 1979 (and hence I suppose I qualify for his 70s epithet).Â As for Mr. Manley’s conversion from Liberal politician to chief executive of the chief executives – well, I’ll let others weigh in on whether there’s any consistency in that or not. Meanwhile, the next morning, CBC’s radio show The Current ran an equally insightful feature on the politics of budget-making, featuring Manley again, former Conservative Finance Minister Michael Wilson, and former Saskatchewan NDP Finance Minister Janice MacKinnon (who was awfully conservative when she held that post, and has become much more so since). The striking thing about that program was how all three of the panellists, in varying ways, endorsed Flaherty’s budget.Â MacKinnon praised Flaherty for doing a good job of restraining spending in the face of so many politically-motivated demands.Â She also commended the government for sticking to its “important fiscal principles” by carrying on with the corporate income tax cuts, even though polls show they are not politically popular.Â The mark of a principled (rather than opportunistic) Finance Minister, through this lens, must therefore be his or her willingness to ignore the preferences of the population.Â That’s the same kind of tough-love governance thinking that led to the reification of so-called “independence” for central banks. The show did include a pre-taped clip from me, where I argued that the budget was more politics than policy in the way it treated the issue of fiscal “restraint.” Â For political reasons the Conservatives think it’s to their advantage to be portrayed as “prudent fiscal managers,” but for equally political reasons they don’t want to spell out what kind of pain that might involve for actual living human beings.Â Therefore, they wave a magic wand at the fiscal forecasts, implying that spending growth can be held to 1% annual growth over a 5-year period (from 2009-10 through 2014-15), without remotely specifying how that would occur.Â (That’s equivalent to an 11% reduction in real per capita program spending over that period. )Â That’s called having your cake and eating it too: running on a reputation of tight fiscal management, without actually tightly managing the fiscus. When Michael Wilson was asked for his response to this argument, he borrowed a page from John Manley’s book:Â “Mr. Stanford, he comes from a certain point of view.”Â Yes, I certainly do.Â And what’s more, I say it all the time.Â And I started saying it in the 1970s.Â OK, now let’s get down to a real debate over ideas. Finally, yesterday’s budget features one more twist in the corporate finance, investment, and taxation milieux: a 2-year extension of the accelerated CCA provision for business capital spending.Â This was introduced as part of the government’s initial response to the recession.Â They indicated that they were going to hold firm to their plan to abolish it this year (motivated in part by the silly fear that if they made a “temporary” tax cut permanent, then no-one in future would believe that any tax cuts are temporary! ).Â Then, yesterday, they surprised many (including me) and extended the provision for another two years. I and others in the labour movement have supported the accelerated CCA provision as a preferred alternative to across-the-board corporate income tax cuts.Â At least with a CCA incentive, the company has to invest something in Canada in order to claim any of the benefit.Â In fact, in my 1999 book Paper Boom I toyed with the idea of 100% write-offs for all domestic capital spending, combined with a high tax on cash accumulation and distribution.Â In this regard, companies would not be taxed for profits that were reinvested in Canada – but would be taxed heavily for profits which were accumulated or distributed. In the present context, however, the accelerated CCA provision has been layered on top of major and expensive cuts to the base corporate tax rate.Â This must rank as one of the greatest instances of double-dipping in fiscal history.Â The attempt yesterday by Mr. Flaherty (and several corporate lobbyists) to suggest that the government’s corporate taxation program thereby has broad support (even from the labour movement) is dishonest and manipulative.Â The CLC has written a public letter to Mr. Flaherty confirming this. One effective way of presenting the issue of private investment (which does not brings good to all Canadians) is to talk about foreign investment. We have become tenant farmers in the natural resources sector. Foreign consumers get our oil, and foreign companies the profits from the non-renewable resource. How good is that? Looking at Canadian investment abroad would be instructive as well. We allow the banks to tax us (fees and charges) and they invest the proceeds abroad (in the U.S.) and lose money. State support for foreign investment by Canadian companies is supposed to be good (ChrÃ©tien and Team Canada), public ownership of Canadian companies (say a national transportation company making public transit vehicles) is bad. “we have to reward investors mightily” – probably quite true, that is as long as the financialzation of the economy transcends the productive economy. Profits from real brick and mirror investment under traditional profit margins cannot compete with profits of speculative behavior, just on sheer risk alone. Easy for me to say-complicated to prove, but it is at the heart of the problem. And until we get regulation in the markets to curtail these super profits, or at least prevent the means of manipulations and other vehicles in financial value creating fiction, we will be one step behind. This one is a bit easier to take on. Just look at the distribution of ownership. Combine that with the notion of economic democracy and I would say we are about as far from that statement as possible. If indeed we did all share in ownership then why cannot we have the corporate taxes share a larger load of the taxes. That would be far more economically democratic. Tax it at the source rather than the shareholders income stream. Sorry that should be brick and mortor, lol, the iPad has humor this morning. Also, the laffer curve is a dustbin sell to me, given an economy that is mainly resources and bankers. Give me a innovative manufacturing sector with less foreign owned assets and then maybe a small laffer effect, with an economic microscope could be detected. Oh by the way Jim, great work on the tube yesterday, do you get overtime pay for that? Seemed like a long day. Hats off, Jim, that was a great day’s work (which as far as I can see must have been a 24-hour day if you banged off the post above after the interviews were done)! So presumably that means taxing income discourages people from getting jobs and doing productive tasks. Sheesh, what am I doing still going in to work every day? But in fact, the two aren’t comparable. After all, corporate “income” taxes are only taxes on profits, not on revenues. Corporate taxes cannot take what would have been a profit and turn it into a loss, only trim the size of the profit. It would be like having an income tax that only taxed whatever was left after you paid for necessities such as food, shelter, clothing and transportation. Wouldn’t it be nice, huh? So. The personal income tax is a much greater disincentive to paid labour than corporate taxes on profits rather than income can be to corporate investment. Clearly if the economy is not to disintegrate as people quit their jobs in droves, the personal income tax must be eliminated. Maybe if we really want corporations to invest, we should tax their savings–put a big tax on corporate liquid assets so they’re forced to invest in capital equipment etc. or lose their money. Hm. Now that I read through the post in more detail, I find that half what I said was already in there. For the sarcasm impaired I should note that there was a heavy helping of it in my comment. IMO the logic of conservative arguments on most economic issues is extremely weak. Much of it is laughable (e.g. Ricardian Equivalence). Conservatives’ strength is in effective, simple messaging (of the sort you experienced), helped by dominance in media outlets. Mainly though they have realised that arguments are not won through rational debate and effectively use that insight. We definitely need to figure out how to defeat their tactics. It can be done but will require much thought and testing. Somebody in New York must be reading this blog? This raises another issue, how many companies actually pay the full amount of taxes, given loop holes, transfer pricing and the like. Wow this sure is an eye opener! Well, ultimately media ownership is a tough hurdle. Everyone seems to forget that not only do small businesses have to pay the federal corporate tax but must also add on the provincial 12% tax rate (In Ontario). We as business owners are faced with a real form of double dipping in taxes. Once we take money out of our company as salary or bonus we get taxed on the money we managed to hang on to as “profit”. It would be very advantages to a small business to retain the income within the company and not be faced with onerous taxes. Cutting corporate tax is good for the economy and a business’ capability to take on employment. Where were the unions when our unemployment fund was raided to pay for some other political ideals we did not need. That fund belonged to the companies and their employees and should have been readily available for use to pay unemployment insurance when needed but also have been available to retrain employees. Much of the retraining is mandated by government but must be paid by small business. Ontarioâ€™s provincial â€œsmall businessâ€ corporate tax rate is just 4.5%. To pay 12%, a Canadian-controlled private corporation would need profits in excess of $500,000 or assets in excess of $15 million. In any case, Ontario is cutting that general rate to 10% by 2013. Unions were the strongest objectors to Ottawaâ€™s raid on the Employment Insurance Fund. Where was business? Great work as usual, Jim. Itâ€™s funny how these guys think they can dismiss your arguments by dismissing you personally. Itâ€™s even funnier how, immediately after doing so, Wilson expressed skepticism similar to yours about the governmentâ€™s expenditure projections. A typically â€œbalancedâ€ CBC political panel: a Conservative, a Liberal, and Janice MacKinnon. The arguments I have read that lean against corporate taxation were more modest than what this article outlines. The line I’ve heard is that incidence of corporate taxation is mostly on labour (firms pass it on with lower wages), but it figures into the investment decision (at the margins) and it might drag a bit on productivity. This is not to suggest that reducing the rate “creates jobs” or “increases competitiveness” or whatever, just that it might help a bit over a long period of time. The incidence argument seems important because it suggests that sloganeering about making “corporations” pay rather than “people” or something sort of misses the point. The fact that big business is pushing it as a bonanza for themselves obviously gives me pause, but the “mild technocratic shift towards slightly more efficient taxes” argument seems like a plausible possibility to me. I think the HST reform could be a comparable “might be mildly beneficial given certain assumptions” move that is both oversold and overattacked. That said, if a mildly inefficient tax gets raised and it funds an antipoverty and public services agenda that would otherwise go unfunded, then there isn’t much to complain about. Practical and optimal might be two different things.